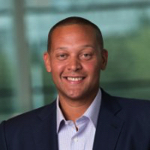 Aaron Hughes is Vice President of Information Security and Deputy CISO at Capital One. In this role he is responsible for leading a diverse team setting the strategic direction for security across all of the Capital One lines of business with a portfolio that includes Enterprise IT, Digital Products, and Data Initiatives. He is the former Deputy Assistant Secretary of Defense for Cyber Policy. In this position Mr. Hughes was responsible for the development and implementation of cyber policies, strategies, plans, and operational oversight for the Department of Defense efforts in cyberspace. Prior to his appointment with the DoD he was a Vice President with the strategic investment firm In-Q-Tel. During his 7 years with the firm he held a variety of roles culminating with leadership of all Intelligence Community engagement, outreach, and strategic relationships. Additionally he assisted in the formulation of investment priorities and technology identification for key In-Q-Tel customers. In addition to his full-time civilian employment, Mr. Hughes is a Colonel (sel.) in the Air National Guard where he serves as the State of Maryland Cyberspace Operations Director focusing on the Cyber Operations mission for the State, USAF, and USCYBERCOM. Aaron received his BS in Mechanical Engineering from the University of Virgina, MS in Telecommunication and Computers from George Washington University, and MBA from the Stanford Graduate School of Business.